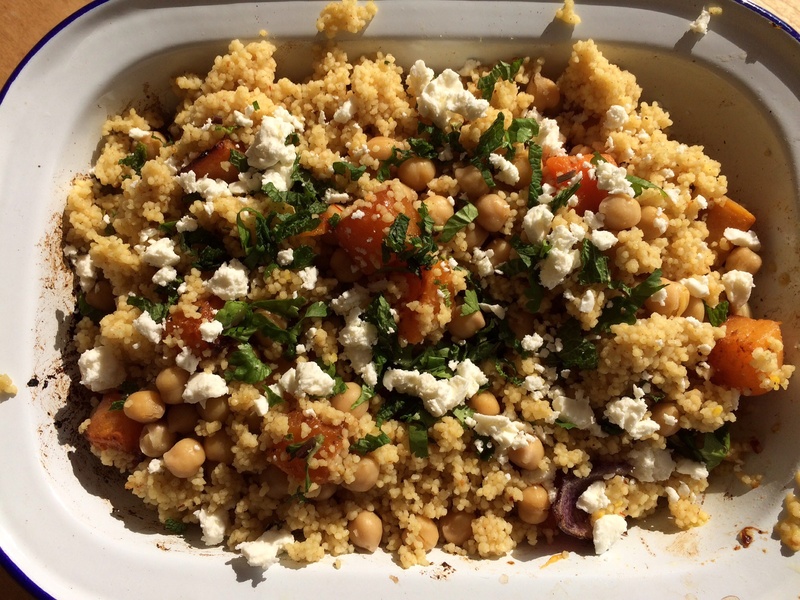 Warm salad of roasted sweet potato and couscous. An autumnal salad, warm and spicy, and very satisfying on a cold October evening. 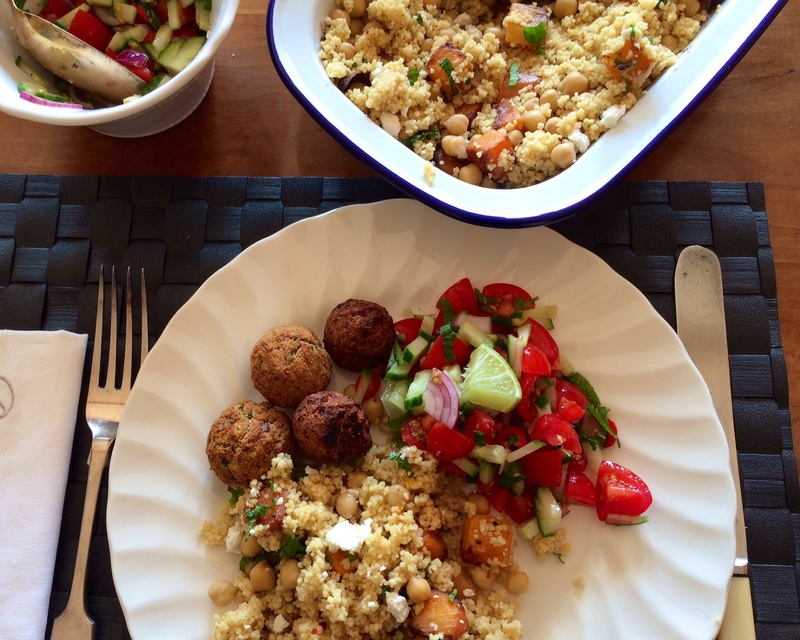 Cubes of roasted sweet potato with garlic, cumin and cinnamon, in a couscous and feta salad. If there’s any left over it’s very nice in your lunchbox tomorrow. And perfect for Meat Free Monday. Put your oven on 200c fan. 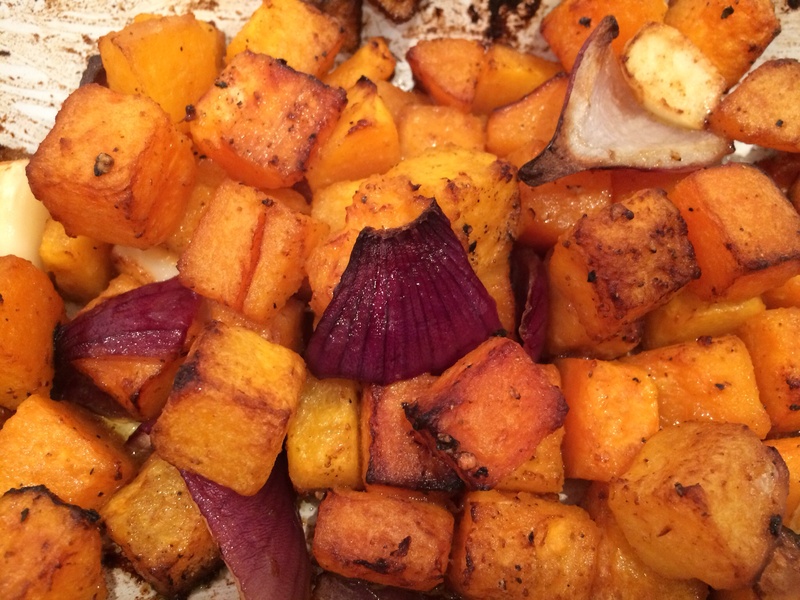 Drizzle approx 2 tablespoons of olive oil into a roasting tray and place in the oven. Peel the potato and chop into cubes. When the oil in the pan is hot add the potato and chopped onion and garlic (in it’s skin), salt and pepper. Mix the paprika, cinnamon and cumin powder and add to the potatoes, stir the potatoes around a little to coat with the spices. Roast in the oven for about 15-20 minutes until the cubes are soft and just starting to brown at the edges. Shake the tray half way through to move the potatoes around. Boil the kettle and make up 200 ml of vegetable stock. Add a small pinch (a few strands of saffron) to the stock. Place the couscous in a bowl and add the vegetable stock, forking through from time to time to separate and fluff the grains. When the potato is ready, mix the couscous into the tray, squeezing the garlic out of its skin and mixing in. Add the chickpeas and crumbled feta cheese, snipped fresh herbs and a little more pepper to taste. A few falafel on the side and a little salad is a nice addition if you’re wanting to stretch to feed a couple more friends. ← Mushroom and egg bake.